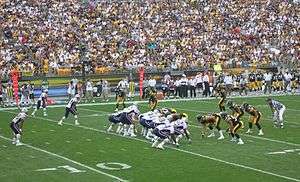 The 2005 Pittsburgh Steelers season began with the team trying to improve on their 15–1 record from 2004 in which they lost to the New England Patriots in the AFC Championship Game at Heinz Field. The Steelers, with the sixth and final seed to the playoffs, became just the second team ever (and the first in 20 years) to win three road games on their way to the Super Bowl. They defeated the NFC Champion Seattle Seahawks in Super Bowl XL to secure their league-tying fifth Super Bowl title. In doing so, they also became the first team since the 1970 AFL-NFL merger to win a Super Bowl without playing a single home playoff game. They are also the first 6th seeded team to beat the top 3 seeds on the road. Notable additions include Heath Miller and Nate Washington. Ben Roethlisberger became the NFL's first quarterback since Trent Green in 2003 to post a perfect (158.3) passer rating, and college backup Willie Parker put up 161 rushing yards and a touchdown in a dazzling NFL debut. Pittsburgh strong safety Troy Polamalu led a defensive onslaught with a career-high three of the Steelers' eight sacks, and Willie Parker followed up his outstanding NFL debut with 111 rushing yards and a touchdown on 25 carries as the Steelers hammered the Texans. As the game took place on a hot, humid day, the Texans left the roof of Reliant Stadium open in the hopes that the Steelers' performance would be hampered by their black jerseys. However, the tactic failed and Houston fans were angered by having to sit in sweltering conditions and watch their team lose. New England quarterback Tom Brady led a five-play, 37-yard drive to Adam Vinatieri's game-winning 43-yard field goal with :01 remaining. The drive countered Hines Ward's 4-yard scoring catch that tied the score at 20–20, but left 1:25 for Brady to march the Patriot offense. On the day, Brady completed 31 of 41 passes for 372 yards, with an interception. Jeff Reed booted a 40-yard field goal with :06 remaining to lift the Steelers to a win, but a play late in the game caused star quarterback Ben Roethlisberger to leave with a hyperextended knee and left his availability for the following week in doubt. The hit came from Charger rookie defensive lineman Luis Castillo and forced Roethlisberger to the sideline, and backup Charlie Batch merely handed off to Jerome Bettis three times to set up Reed's kick. Tommy Maddox capped a poor performance by throwing an overtime pass into a crowd of Jaguar defenders, and Rashean Mathis made him pay dearly, intercepting the pass and returning it 41 yards for the game-winning touchdown. Subbing for an injured Ben Roethlisberger (hyperextended knee), Maddox completed just 11 of 28 passes for 154 yards, with a touchdown and three interceptions. Pittsburgh regrouped following a sloppy first quarter to take an easy win in Cincinnati. After allowing two marches into the Steeler red zone, the defense tightened and gave up only two field goals, then coasted on the heels of two Ben Roethlisberger touchdown strikes and 131 rushing yards from Willie Parker. Underachieving against a Ravens team missing defensive standouts Ray Lewis and Ed Reed, the Steelers regrouped on the heels of a late 60-yard drive that set up Jeff Reed's game-winning 37-yard field goal with 1:36 remaining. Ben Roethlisberger completed 18 of 30 passes for 177 yards, 2 touchdowns and an interception. With Charlie Batch starting at quarterback for an injured Ben Roethlisberger (knee), the Steelers capitalized on Packer mistakes – three turnovers – and won despite a lackluster offensive showing. The game's highlight came from Troy Polamalu, whose sack of Brett Favre forced a fumble that Polamalu himself scooped up and returned 77 yards for a second-quarter touchdown. The Steelers handled the division-rival Browns despite another serious quarterback injury. Backup Charlie Batch, subbing for Ben Roethlisberger, broke his hand late in the first half and exited. Beleaguered third-stringer Tommy Maddox inherited a 17–7 third-quarter lead and, despite some miscues, cruised to the win. Wide receiver (and college quarterback) Antwaan Randle El completed a 51-yard scoring pass to Hines Ward in the third, making Ward the team's all-time receptions leader (passing Hall of Fame wideout John Stallworth). An anemic offensive showing led to a surprising Steeler defeat at the hands of the Ray Lewis-less Ravens. Third-team quarterback Tommy Maddox got the starting nod and completed 19 of 36 passes for 230 yards, with a touchdown and an interception (a bizarre play that caromed off of wideout Hines Ward's swinging foot and was snatched by Terrell Suggs), but the Steelers' inability to handle the Raven pass rush was a serious blow. Maddox was sacked six times and under nearly constant duress. Matt Stover won the game on a 44-yard field goal in overtime. The banged-up Steelers were simply no match for the undefeated Colts on Monday Night. Indianapolis' first offensive play proved a harbinger for the Steelers, with Marvin Harrison scorching Pittsburgh cornerback Ike Taylor on an 80-yard touchdown strike and a 7–0 advantage. Ben Roethlisberger's return from a two-game absence (knee injury) was a shaky one; his first interception potentially caused a six-point swing, snuffing out a Steeler drive late in the first half and setting up the Colts to kick a field goal, taking a 16–7 lead into the break. Roethlisberger's struggles were heightened when injured left tackle Marvel Smith grew less and less able to deal with All-Pro Colt pass rusher Dwight Freeney & Co., and eventually left with an ankle injury. Ben Roethlisberger put up the most prolific numbers of his young career in his return from a knee injury, but he was ultimately out dueled by Carson Palmer. Roethlisberger outpassed his counterpart 386–227 and each threw three touchdowns, but his three interceptions were backbreakers. Ultimately, the Bengals simply made too many big plays, including a 94-yard kickoff return by Tab Perry, for the Steelers to keep pace. In a snowy atmosphere, the Steelers snapped their three-game losing streak by ending the Bears' eight-game winning run. Jerome Bettis churned through the snow and mud for a season-high 101 rushing yards, scoring twice in the physical win. Desperately trying to keep pace in the AFC playoff picture, the Steelers again dominated an NFC North opponent and again snapped a winning streak. The Vikings had won six straight games, but were pounded up and down the field in losing to Pittsburgh. The Steelers forced three Minnesota turnovers and added a safety in the victory. The Steelers turned a nearly flawless performance into a dominating win in Cleveland. The Browns were sacked eight times and were never really in the game. Willie Parker's 80-yard touchdown scamper in the third quarter broke the game open at 27–0. Ben Roethlisberger completed 13 of 20 passes for 226 yards and a touchdown before giving way to Charlie Batch with the game well in hand. Mere weeks after being all but counted out in an extremely tight AFC playoff race, the Steelers clinched a Wild Card berth, trading punches with lowly Detroit and coming out on top. Unexpectedly, the 5–10 Lions leapt to a 14–7 first-quarter lead on two Joey Harrington touchdown passes, but Jerome Bettis tied the game later in the period with the first of his three touchdown runs in his final game in Pittsburgh. Bettis and Willie Parker combined for 176 rushing yards as the Steelers closed out their regular season. The Pittsburgh Steelers become the 4th wild card team to win the Super Bowl. ↑ 2005 Pittsburgh Steelers Media Guide. ↑ "2005 Pittsburgh Steelers". Pro-Football-Reference.com. Retrieved 2014-12-27.